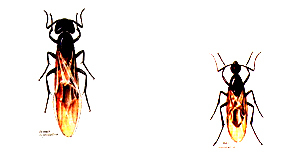 Carpenter ants vary in size and color but are usually large (1\4-1\2 inch) and blackish. In Western Massachusetts most all black ants are a species of carpenter ant. Swarms of winged carpenter ant reproductives may on occasion emerge inside a home. These swarms usually occur in the spring and are a sure sign that a colony is nesting somewhere inside the structure. Besides being objectionable by their presence, carpenter ants damage wood by hollowing it out for nesting. They excavate galleries in wood, which have a smooth, sandpaper appearance. Wood, which has been damaged by carpenter ants, contains no mud-like material, as is the case with termites. Shredded fragments of wood, similar in appearance to course sawdust, are ejected from the galleries through preexisting cracks or slits made by the ants. When these sawdust accumulations are found, it is a good indication that the carpenter ant nest is nearby. Oftentimes, however, the excavated sawdust remains hidden behind a wall or in some other concealed area. Carpenter ants nest in both moist and dry wood, but prefer wood that is moist. Consequently, the nests are more likely to be found in wood dampened by water leaks, such as around sinks, bathtubs, poorly sealed windows/door frames, roof leaks and poorly flashed chimneys. Nests are especially common in moist, hollow spaces such as a wall void behind a dishwasher, or in a hollow porch column. Established carpenter ant nests often produce a “rustling” sound similar to the crinkling of cellophane. Carpenter ants may establish nests in a number of different locations. It is important to realize that these locations can be either inside or outside the structure. Carpenter ants actually construct two different kinds of nests: parent colonies which, when mature, contain an egg laying queen, brood and 2000 or more worker ants, and satellite colonies which have a large number of worker ants but no queen, eggs or young larvae. Carpenter ants inside a home may have originated from the parent colony or from one or more satellite nests. For example, the ants may be coming from the parent nest located outdoors in a tree stump, landscape timber or woodpile, or from one or more satellite nests hidden behind a wall in the kitchen or bathroom, or perhaps from wood dampened by a roof leak in the attic. The extent and potential damage to a home depends on how many nests are actually present within the structure, and how long the infestation has been active. Although large carpenter ant colonies are capable of causing structural damage, the damage is not normally as serious as that from termites. In some cases, the damage may be relatively insignificant, but locating and exposing the nest area can only determine this. Locating Carpenter Ant NestsThe most important and often most difficult part of carpenter ant control is locating the nest(s). Recent studies have shown that carpenter ants follow distinct scent trails between the satellite colonies and the parent nests. Minuteman will use this trailing behavior displayed by carpenter ants to locate and eliminate the nests. Often children and adults of the residence know where ants are seen, where large numbers are most prevalent, movement patterns, moisture in the structure, moisture problems of the past, if swarmers were seen, location of sawdust-like-material in piles, populations outdoors, etc. Once Minuteman has located the nest(s) or suspected problem nest areas, we will design a customized treatment program to effectively eliminate the carpenter ants. A few random applications of pesticides will not do the job. Minuteman uses the latest technology and materials to treat for the carpenter ants, which have invaded your home. Minuteman goal is to eliminate your problem while minimizing the amount of pesticides placed in your home. We accomplish this by a careful, targeted indoor and outdoor application. Minuteman has a preferred method of application to eliminate the carpenter ants within your home using a combination of highly effective baits. These baits have been specifically developed to attract carpenter ants to feed on them. Unknowingly the foraging ants feed on the baits, eventually return to the colony, and share this lethal bait with other ants. Therefore, unlike traditional pesticide sprays that are broadcasted into critical areas, baits are “delivered” right to the colony by their own workers. As the ants continue to feed on the baits, the colony will eventually be eliminated. Occasionally there are situations when a colony of ants needs to be eliminated using a pesticide. Minuteman will use state-of-the-art equipment to inject a low hazardous pesticide directly into infested area. In certain situations, we may need to drill very small holes (1\8 inch in diameter) to eliminate these nests. This careful, targeted application reduces pesticide use in your home because we are targeting the infestations at their source. Minuteman recommends that protective applications around the exterior of your home on a regular basis (Spring-Summer) to help keep carpenter ants from re-establishing. 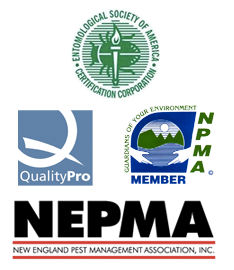 These regularly scheduled applications will not harm children, pets or the plants around your home. If an full interior treatment has been done, Minuteman will guarantee you service for the interior of your home at no addition charge should additional treatments be necessary, as long as there have been no lapses in the seasonal exterior treatments. • Correct any moisture problems that exist around the home, particularly in areas that have drainage or aeration problems (such as leaking roofs, gaps in siding, clogged gutters or faulting plumbing). • Trim shrubbery and trees away from the house. • Replace water-damaged or decayed wood. Wood should not be in contact with soil. • Remove stumps and dead trees (A 50-foot cleared perimeter around the house is recommended). • It is not necessary to remove healthy trees, but broken branches and any other damage or holes in nearby trees should be repaired or eliminated.